Our 7th grade spelling words will help you target your spelling instruction and practice. By seventh grade, students should have a strong foundation in the basics. But many students may still need to review and strengthen their skills in some areas, including adding suffixes such as -able, -ible, commonly confused words, frequently misspelled words, and new vocabulary words. 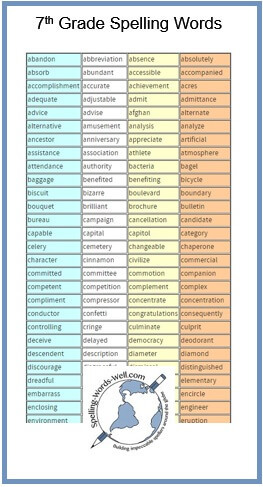 Here's our list of 300 7th grade spelling words, selected from several popular resources. Please note that this list offers a general guideline. Your curriculum and the needs of your students may vary. Please check out our 6th grade spelling resources, too! As an Amazon Associate I earn from qualifying sales. 101 Word Play Puzzlers Discover the FUN of letters & words as you solve each unique puzzle. Great vocabulary & spelling practice!